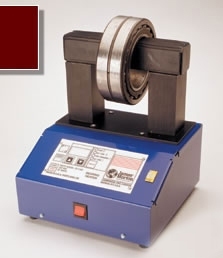 The Reco Induction Bearing Heater is the superior method of expanding bearings, gears, sprockets, couplings and sleeves. For placement on shafts, it is the safest, quickest, most economical method of applying heat. All bearing heaters are single phase 60 hz units. 50 hz versions available as special request. SC 4-3/4" 3-5/8" 3/4" 3/4" 9-1/4" 9"
BC 8" 7" 1-1/4" 1-1/4" 14-3/4" 16"
BC Special 12-1/4" 7" 1-1/4" 1-1/4" 18-3/4" 16"
Bearing Capacity 11" O.D x 4" wide. Computer chip automatically monitors and stabilizes temperature. Optional raising block available to increase bearing O.D. 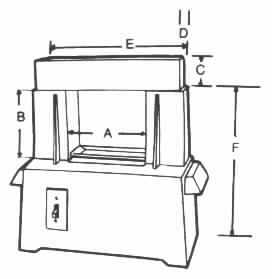 capacity to 14"
All bearing heaters are single phase. Bearing capacity:11" O.D x 4" wide. ** The SC220 is not supplied with a plug as there are many variations of 220/240outlet. End user has to install one that matches their own system. RECO-SC110 110V ( 17 amp) 3/4", 2" 1-1/4"
RECO-SC220** 220V ( 11 amp) 3/4", 2" 1-1/4"
Optional raising block available to increase bearing O.D. 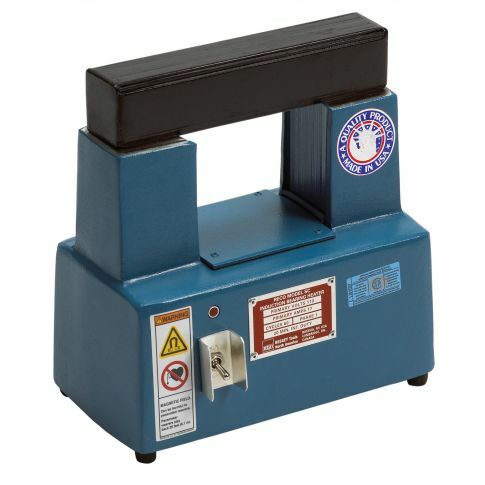 capacity to 32"
220V ( 30 amp) 1-1/4, 3" 1", 2"
RECO-BC440 440V ( 20amp) 1-1/4, 3" 3/4", 1", 2"
RECO-BC550 550V ( 15 amp) 1-1/4, 3" 3/4", 1", 2"
220V ( 30 amp) 1-1/4, 3" 1" *, 2"
RECO-BCS440 440V ( 20 amp) 1-1/4, 3" 1" *, 2"
RECO-BCS550 550V ( 15 amp) 1-1/4, 3" 1" *, 2"
Simply remove bar, turn heater on and pass bearing several times between the two upright columns without contacting columns. DO NOT operate an induction bearing heat if you have a heart pace-maker. The strong magnetic field emitted my the heater may affect operation of such devices. SC raising blocks increase SC bearing heater capacity up to 14" OD. (fits SC bearing Heaters) 2-3/8" 2-5/8" 7.5 lbs. (fits BC and BC Special Bearing Heaters 5" 3-5/8" 31.0 lbs.